As anyone who has read this site since I joined almost five years ago, Faith No More is my be-all end all band of all time. 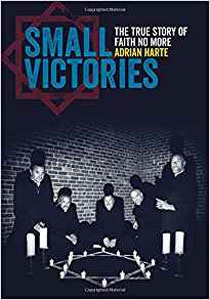 There have been at least two books in the last 25 years that chronicled the band, but Adrian Harte’s chronicle, complete with new interviews with everyone in the band’s history (minus Jim Martin and Mike Patton) is as definitive a piece as you’ll ever get. With almost minute detail about the band’s early years all the way through their breakthrough with “Epic” and The Real Thing, fans and non-fans will find themselves ecstatic about the information contained within. There’s not much negativity that one could say about this tome. I have read other reviews that said after the earth-shattering weirdness of Angel Dust that the book takes a hurried tone towards the years leading up to the band’s breakup in 1998. There is some more info that could have been inserted regarding the chaotic King For A Day/Fool For A Lifetime sessions, but overall it feels like Harte squeezed as much relevancy into the book as he possibly could. For myself, this book was a dream come true. I read the thing through in three hours and learned even more about this band than I’d already learned in my 25+ years of being a diehard fan. Even people who are only familiar with the band through “Epic” or “Midlife Crisis” will be entertained and fascinated by what’s within. There’s no real Behind The Music scenarios found except for a dash of heroin and the overdose death of Chuck Mosley in 2017, but the band’s ego and sometimes fractious relationships will make you more interested in the band. Whether you’re a diehard like me or a novice fan just interested in a music biography, there’s something here for everybody. I’m not just saying that because I’m a credited source in this thing, I say it as top 10 all-time fan.